1SaleADay is not a reliable application. As a matter of fact, this browser extension published by Gratifying Apps may open up security vulnerabilities and create different opportunities for unreliable and unfamiliar third-party associates. Even though 1SaleADay appears to do nothing else but present beneficial pop-up and banner offers, in reality, it presents sponsored links which may route you to a number of different sites. Unfortunately, this is a security vulnerability that unreliable parties often use to activate different scams, and so you should remove 1SaleADay without further delay. We identify 1SaleADay as an advertisement-supported program because it presents sponsored links hidden behind attractive deals, coupons, saving offers, and other type of advertisements. As it has been discovered recently, 1SaleADay ads may be hand-picked accordingly to your own web searches and virtual preferences because the program runs web cookies which are set to record information about your activity. Even if you want to postpone 1SaleADay removal, which we do not recommend, you certainly should not hesitate to delete suspicious tracking cookies. 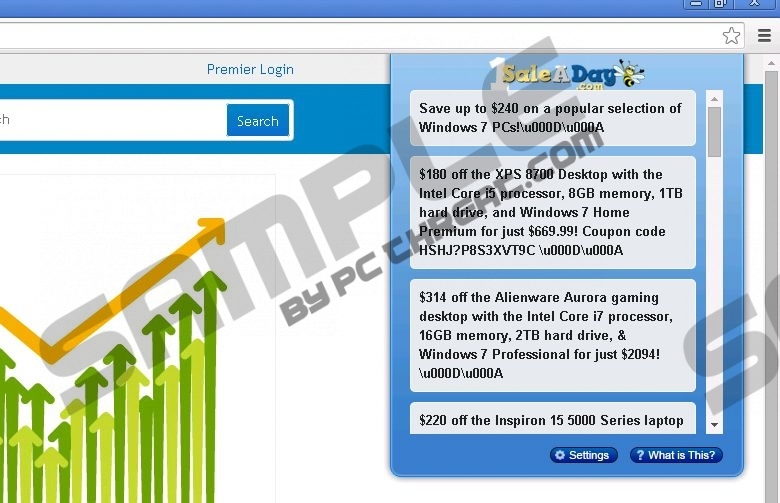 There is no doubt that 1SaleADay comes bundled with third-party applications, simply because it is not possible to acquire the program from 1saleaday.com or 1sale.com. Software bundling in itself is not a malicious or unreliable practice. In fact, plenty of authoritative and reputable companies promote their software and services using this method. Nonetheless, it is more likely that you will need to delete 1SaleADay related software from the system. The disturbing adware may enter the system bundled with other clandestine advertisement-supported programs or PUPs which will need to be removed. 1SaleADay has a lot of suspicious permissions. For example, it can access your data on all websites, and it can communicate with cooperative native applications. These permissions would not be disturbing if 1SaleADay was a trustworthy application. Unfortunately, it is not. If you do not delete the application rigth away, it may collect data and silently send it to remote servers controlled by unfamiliar parties. This could be dangerous to the security of your virtual identity. Furthermore, more alluring scams could be introduced. You can install automatic malware removal software to delete 1SaleADay from the Windows operating system. This is the option we recommend because the manual option is quite complicated, and not all computer users will be able to succeed. Of course, if you know how to remove leftover files, go ahead and follow the guidance of the manual 1SaleADay removal instructions presented below. Open the Control Panel to find more options and click Uninstall a program. Right-click the application you wish to delete from the PC and select Uninstall. Navigate to the left of the Task Bar and click the Windows/Start button. Select Control Panel and in the presented menu click Uninstall a program. Locate the program you want to delete, right-click it and select Uninstall. Double-click Add or Remove Programs and then click Change or Remove Programs. Click once on the undesirable application and select Remove to get rid of it. Simultaneously tap Ctrl+Shift+A to open the Add-ons Manager and click Extensions. Find and Remove the undesirable extension. Simultaneously tap Alt+F, in the appeared menu click Tools and select Extensions. Identify the undesirable extension, click the trash icon on its right and select Remove. Simultaneously tap Alt+T, select Manage Add-ons and click Toolbars and Extensions. Find the undesirable add-on, select it, click Disable and then Close. Quick & tested solution for 1SaleADay removal.